1000 - Stephen I, a descendant of Arpad, recognized by Pope as first Christian king of Hungary, expands Hungarian control over Carpathian basin. 1077-1095 - Reign of King Ladislas (Laszlo) I, who establishes Hungarian control over Croatia. 1222 - King Andrew II issues the Golden Bull, a constitutional document limiting the king's power and enshrining rights of the nobility. 1241-1242 - Mongol invasion devastates large parts of Hungary. 1301-1308 - End of the dynasty of Arpad results in interregnum, ended by election of Charles I of Anjou. 1342-1382 - Reign of Louis the Great, who annexes Dalmatia and founds Hungary's first university at Pecs. 1456 - Forces led by Hungarian nobleman Janos Hunyadi defeat Ottoman forces at Siege of Belgrade. 1526 - Ottoman Turks defeat forces of Hungarian king at Battle of Mohacs, establishing control over most of the country. 1918 - Austro-Hungarian Empire is broken up at the end of World War I. Hungarian republic is proclaimed following a revolution. 1919 - Communists take over power under Bela Kun. Kun wages war on Czechoslovakia and Romania. 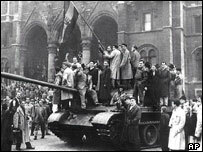 Romanian forces occupy Budapest and hand power to Admiral Miklos Horthy. 1920 - Hungary loses large part of territory to Czechoslovakia, Romania, Russia and Yugoslavia. The National Assembly restores Kingdom of Hungary; Horthy becomes regent and remains influential until 1944. 1938 - Hungary regains some of the territory lost in 1920. 1939 - Hungary joins Anti-Comintern Pact of Germany, Japan and Italy. At the outbreak of World War II Hungary remains neutral. 1941 - Germany invades the Soviet Union. Hungary declares war on the Soviet Union. A large part of the Hungarian army is destroyed. Hungary declares war on the United Kingdom and the United States. 1944 - Hungarian Nazis depose Horthy and install a puppet regime after Horthy asks advancing Soviet troops for an armistice. Hungarian Jews and gypsies are deported to death camps. 1945 - Soviet forces drive the Germans out of Hungary by early April. Large parts of Budapest are reduced to rubble by the fighting. New Hungarian government introduces land reform bill, redistributing land from large estate owners to peasants. 1947-48 - Communists consolidate power. Hungary aligns itself more and more with the Soviet Union. 1949 - A new constitution makes Hungary a workers' and peasants' state. Industry is nationalised, agriculture collectivised and a wave of police terror launched. 1956 - National uprising. Protesters demand the withdrawal of Soviet troops. Imre Nagy becomes prime minister. Nagy announces plans for Hungary to withdraw from the Warsaw Pact and become a neutral power. Soviet forces crush the rebels, thousands are killed. Nagy takes refuge in the Yugoslav embassy, from where he is abducted by Soviet agents. Janos Kadar becomes head of government. 1958 - Announcement is made that Imre Nagy has been executed for high treason. 1960s - Kadar gradually introduces limited liberalising reforms. Political prisoners and church leaders are freed, farmers and industrial workers given increased rights. 1968 - New Economic Mechanism brings elements of the market to Hungarian socialism. 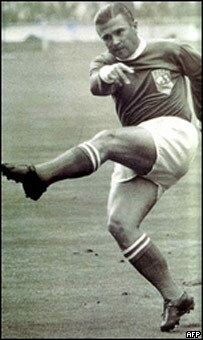 1988 - Kadar is replaced by Karoly Grosz. Opposition groups form the Hungarian Democratic Forum. 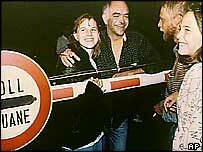 1989 - May - Border with Austria is opened, the 'Iron Curtain' is breached. Thousands of East Germans escape to the West. Communist state in Hungary is dismantled and a transition to a multi-party democracy starts. 1990 - Stock exchange opens in Budapest. A centre-right coalition wins elections. 1990 June - Hungary withdraws from any participation in Warsaw Pact military exercises. 1991 - Soviet forces withdraw from Hungary. The Warsaw Pact is dissolved. 1994 - Former communists and liberals form coalition following elections. Gyula Horn, the leader of the reform communists, pledges to continue free-market policies. 1997 - Referendum endorses joining Nato. 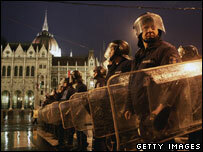 The European Union decides to open membership talks with Hungary, which begin in 1998. 1998 - Centre-right coalition under Viktor Orban elected. 1999 - Hungary joins Nato. 2000 February - Government appeals for help after cyanide waste from a dam at a mining works in neighbouring Romania enters Hungary's second biggest river, the Tisza. 2000 August - Ferenc Madl takes office as president. 2001 June - Parliament backs controversial Status Law entitling Hungarians living in Romania, Slovakia, Ukraine, Serbia, Croatia and Slovenia to a special identity document allowing them to work, study and claim health care in Hungary temporarily. 2002 May - Peter Medgyessy forms new centre-left coalition government in which the Socialist Party partners the liberal Free Democrats. 2002 June-July - PM Medgyessy admits to having worked as a counterintelligence officer for the secret service in the late 1970s and early 1980s. However, he denies ever having collaborated with the KGB and says he worked to steer Hungary toward IMF membership without Moscow's knowledge. 2002 December - EU summit in Copenhagen formally invites Hungary to join in 2004. 2003 April - Referendum overwhelmingly approves Hungary's membership of an enlarged EU. However, turnout is only 46%. 2003 June - Parliament amends controversial Status Law on work, health and travel benefits for ethnic Hungarians in neighbouring countries which criticised it as interfering with their sovereignty and discriminating against other ethnic groups. 2004 1 May - Hungary is one of 10 new states to join the EU. 2004 September - Former sports minister Ferenc Gyurcsany becomes prime minister following resignation of Peter Medgyessy in row with coalition partner over reshuffle. 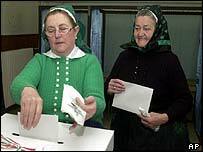 2004 December - Low turnout invalidates referendum on whether or not to offer citizenship to some five million ethnic Hungarians living outside Hungary. 2005 June - Parliament chooses opposition backed Laszlo Solyom as next president after Socialists' candidate is blocked by their Free Democrat coalition partners. 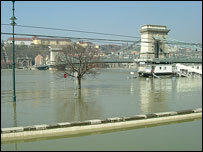 2006 April - More than 10,000 troops and police battle floodwaters as the Danube river reaches record levels. General elections return to power Socialist-led coalition under Prime Minister Ferenc Gyurcsany. 2006 September - Violence erupts as thousands rally in Budapest demanding the resignation of Prime Minister Gyurcsany, after he admitted his government had lied during the election campaign. 2006 October - Violent anti-government protests in Budapest overshadow 50th anniversary commemorations of the 1956 uprising against Soviet rule. 2007 February - A commission of enquiry into the previous autumn's disturbances, in which 800 people were hurt, finds fault with the police, the government and the country's whole political elite. 2007 September - Riot police use tear gas and water cannon to disperse far-right protesters ahead of 51st anniversary of 1956 uprising. 2008 March - Government defeated in opposition-sponsored referendum calling for abolition of new fees for health care and higher education. The move is seen as a setback for government plans for economic reforms. 2008 April - Mr Gyurcsany reshuffles his cabinet after the Alliance of Free Democrats quits the ruling two-party coalition. 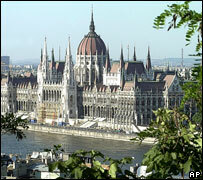 2008 October - Hungary is badly hit by the global financial crisis and the value of the forint plummets. The International Monetary Fund (IMF), the EU and the World Bank grant the country a rescue package worth $25bn (£15.6bn). 2009 March - Hungary and Russia sign deal to build part of the South Stream pipeline across Hungarian territory. Budapest also agrees to jointly build underground gas storage facility in Hungary, a move which will turn the country into a major hub for Russian gas supplies. Ferenc Gyurcsany announces his intention to resign as prime minister, saying he is quitting to allow a new leader, with broader support, to tackle the country's ailing economy. 2009 April - Economy Minister Gordon Bajnai takes over as PM; he announces a programme of public spending cuts, tax rises and public wage freezes. 2009 June - Far-right Jobbik party wins three seats in European Parliament elections, gaining almost 15% of Hungarian votes. 2010 April - Conservative opposition party Fidesz wins landslide victory in parliamentary election, gaining two-thirds majority. Jobbik enters Hungarian parliament for first time, winning 47 seats. 2010 May - Parliament passes law allowing ethnic Hungarians living abroad to apply for Hungarian citizenship. Slovakia protests at move, accusing Hungary of revisionism, and threatens to strip any Slovak who applies for dual nationality of their Slovak citizenship. 2010 July - International lenders suspend review of Hungary's 2008 funding arrangement, saying the Fidesz government has failed to spell out its plans for bringing down the budget deficit clearly enough. 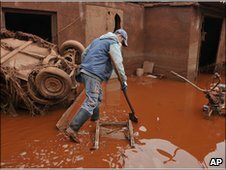 2010 October - A state of emergency is declared after a torrent of toxic red sludge escapes from a reservoir of chemical waste, killing seven people and injuring 150. Rivers in western Hungary are left seriously polluted by what is thought to be the country's worst-ever chemical accident. 2011 January - Controversial new media law - which critics say curbs media freedom - comes into force just as Hungary takes over presidency of EU. 2011 February - Government agrees to amend media law. European Commission says that the changes meet its concerns over media freedom. 2011 April - Parliament approves a new constitution said by its advocates to complete the transition from a totalitarian to a democratic system. Opponents say it threatens democracy by removing checks and balances set up in 1989 when Communism fell. The EU expresses concern over the law and asks for it to be withdrawn. 2011 December - Parliament approves controversial new election law that halves the number of MPs and redraws constituency boundaries. Critics object that the new law undermines democracy by tilting the system in favour of the ruling Fidesz party. Parliament passes controversial law on central bank reform that gives the government greater control over monetary policy matters such as interest rates. EU and IMF officials cut short aid talks with Hungary over the law. The European Central Bank also expresses concern, saying the new law creates the potential for political control of the Hungarian central bank. 2012 January - Top rate of VAT is increased from 25% to 27% - the highest rate in the EU - as part of a series of austerity measures aimed at curbing the budget deficit. Tens of thousands of people take part in protests in Budapest as controversial new constitution comes into force. Credit ratings agency Fitch downgrades Hungary's credit rating to junk status. Two other main ratings agencies have already reduced Hungary's rating to junk levels within previous six weeks. 2012 February - Hungarian state-owned airline Malev goes bankrupt.